Project obstacles and solutions: In 2013, Purdue University announced it would build a new softball stadium as part of its Mackey Complex master plan. The $13 million project provided seating for 1,000 spectators, a pressbox, heated dugouts, two separated bullpen areas, locker rooms and offices. Fetters Construction was awarded the contract for the project. Construction began on the stadium in February 2014 during one of the coldest months on record, with temperatures dropping to -16 degrees F. The early work of pouring the stadium footings, bullpen walls and dugouts were started in the cold. IMI worked with Fetters to monitor the weather and accelerate set times based on the daily ambient temperature range and size of the crews. As the spring weather arrived, Fetters began construction on the locker rooms, indoor practice facility, offices, meeting rooms, suites and press box areas. IMI supplied concrete for the foundation and walls of this main facility. During the summer, Fetters formed up the cast-in-place seating, ramps, sidewalks, ticketing, concessions, and concourse areas. IMI kept pace with the demand for concrete from the first footing to the final sidewalk. IMI supplied over 4,000 yards of concrete for the stadium. 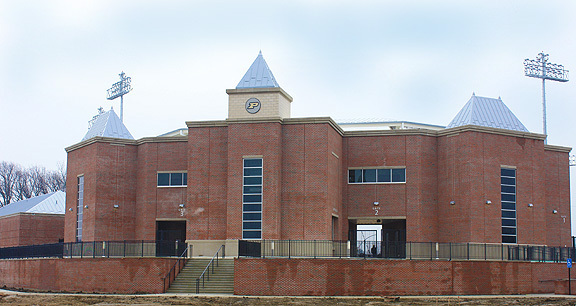 The new Purdue Softball Stadium opened on March 20, 2015 and was dedicated on April 11, 2015. Take a look at the Purdue Softball Team's reaction to their first walk through of the new facility.